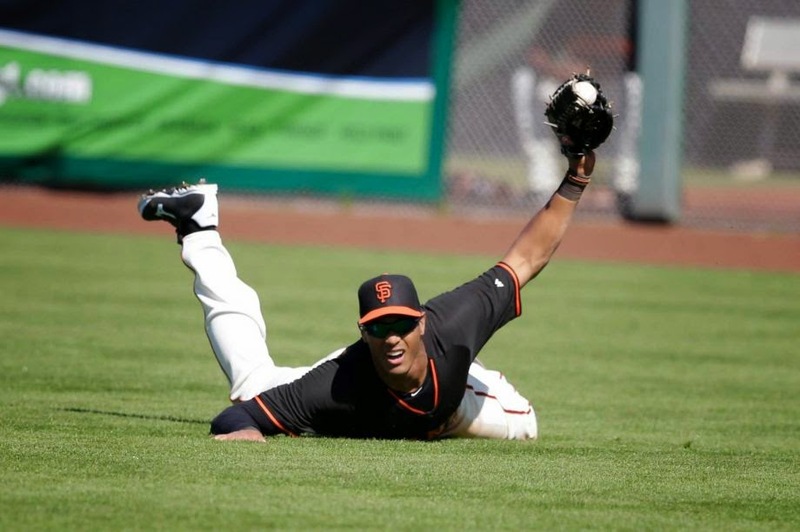 There’s no doubt that San Francisco Giants Justin Maxwell was the team MVP last week. In five games he had three homers, six RBI- including the walk-off extra-inning winner on Thursday- and went 6-for-20 (.300) while making some outstanding defensive plays in the field as the G-men swept the Dodgers thanks in large part to Maxwell. He continued it in an abbreviated Rockies series. Here's the best play he made all week. That offensive production, by the way, equaled or bettered his entire 2014 season, when he was a little-used sub for the American League Champion Kansas City Royals. He did receive a pennant ring along with fellow former Royal Nori Aoki, but he contributed to the champs about as much as I did. That’s not a knock on the guy, that’s the truth. By making such big contributions with so little expected, Maxwell becomes the latest in a line of recent Giants who have done the same thing, albeit the others did their stuff during pennant races or the playoffs- Cody Ross in 2010, Barry Zito in 2012, and Joe Panik last season come to mind. Because Maxwell has done his stuff in the first weeks of 2015, the glove he wore while making that great catch against the Dodgers won’t go into the museum next to the Rally Thong… at least not yet. Maxwell fits the Giants’ mold because he’s only gotten this chance because Hunter Pence has been hurt. But because this has happened a lot to the Giants, it’s got to be another credit to Bruce Bochy for making little-used guys feel like they’re part of something bigger. A quick glance at Maxwell’s career shows that he’s not had achance to play regularly. He’s only played more than 75 games in a season once, when he played 124 for the 2012 Houston Astros. That team lost 107 games in their final National League season and was part of one of the statistically worst series in baseball history- their final three games against the Cubs became one of the few times that two teams with 100 losses played each other. What happened next shows how lightly Maxwell has been regarded: the next season, the Astros traded him for a minor league pitcher. The worst team in the majors got rid of a guy who played 125 games for them. Two years later, he’s at least a one-week wonder for the defending World Champions. Bochy has made Maxwell- and many other players- believe in themselves after not getting perhaps the best treatment. Bochy’s managerial style has gotten a guy like Maxwell, whose enthusiasm might be flagging after years bouncing around the leagues, excited about putting himself and his body on the line, if only temporarily. Even if Maxwell gets relegated to bench duty and spot starts after Pence comes back, Bochy will have a measure of trust in the guy, and Maxwell will know that he’s getting a fair shake. If all he does the rest of the season is play well against the Dodgers, Giants fans will be satisfied, that’s for sure. Then Maxwell’s play will be part of the stories that people tell about the best rivalry in baseball, no matter what the Easterners say. That won’t be a bad major league legacy for a guy who didn’t have much of one heading into 2015. "Glad you're on my team. Uh, what was your name?"